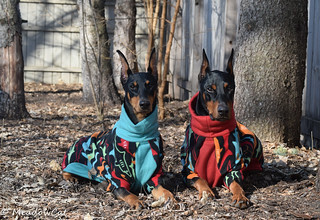 Doberman Forum : Doberman Breed Dog Forums > Doberman Talk Regional Forums > US Regions > Northwest US Region > What pet insurance is good? Hi We are looking for pet insurance for our Doberman puppy. After 5 visits to her vet we had paid over about $1300 and she still has her symptoms. Currently looking for another vet. I like Embrace. Some folks really like Trupanion. You really need to educate yourself on the differences between companies and individual policies. Also, generally an insurer will not cover pre-existing illnesses. This is something that you should ask about in a live (chat or phone) conversation with company rep. I also recommend what John said - talk to the company about what will and will not be covered as pre-existing. Some things may be covered after a certain waiting period, some things may be excluded forever. You have to really understand the policy you are buying, what co-insurance is, what deductibles are, what waiting periods are, etc. Sometimes I see people really angry that something is excluded when they simply didn't understand what they bought. Things like prescriptions being excluded, when that was never part of their policy to begin with. Take the time to understand what you are getting for your money.